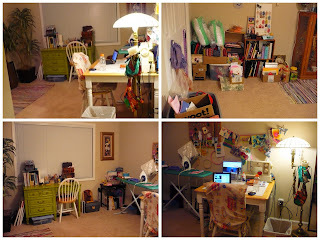 My craft room, along with much of my home, has been a complete blast area for the last couple of weeks. I cleaned downstairs yesterday, soooo today it was time to tidy the craft room. I wish I would have gotten more before pics, because this place was a junk yard. You can't even see all the tiny little scrappy crap all over the floor. So in lieu of much crafting tonight, this is the fruit of my labors. Haha, I wish the change was more dramatic. Rather, it still looks mighty cluttered. I blame this on my desperate need for a book shelf. Maybe you can see the abundance of cardboard boxes acting as makeshift shelves and storage.